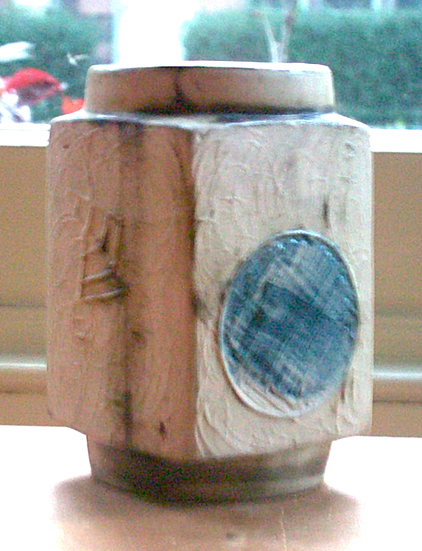 Carn Pottery was set up in Cornwall in the 1970s by John Beusmans and is still in production. cool - would you mind adding the base photo to our Marks Gallery in the Studio section? Yes Pip, I'll do it this evening. Do you know what the x4 on the base refers to please? I'm afraid I don't Sue but I have a Carn Pottery book around here somewhere. When I've tracked it down I'll take a look and see if it's in the book. Letters A, X and Y represent designs introduced 1972 - 1978. The number is the design shape number and variation. Number alone is between 1966 and 1972. N 1 to N42 1978 - 1986. W10 - W25 and Flat Cats FC1 - FC9 are 1999 onwards. This is a general rule of thumb, but there are variations, so beware. 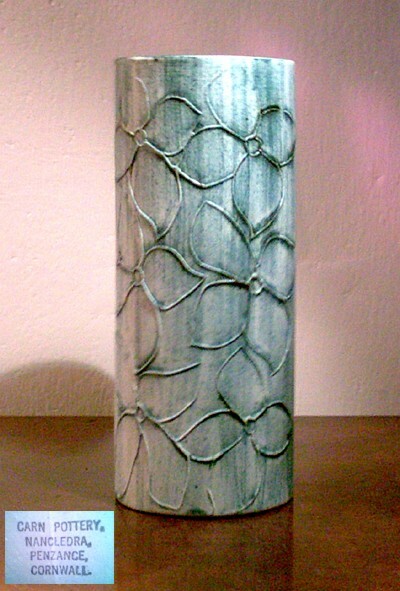 Fan Vase , not signed but with number only. Pip wrote: Carn Pottery was set up in Cornwall in the 1970s by John Beusmans and is still in production. I have over 120 pieces of Carn including a rare hammer and some wonderful trapeziums. Most of his older pieces are often not signed or marked as his old stamps faded over time and he often marked numbers in crayon or anything he could lay his hands on. His pieces are so easy to identify that marks are not necessary and can make a lot of money. I sold a lot last year as I am now collecting different studio pottery but I still love his work which is always based on his love of Cornwall, the fauna, flora, scenery and myths and legends as with his cats. I just bought this little owl , don't know if I paid too much for it , but don't think so . I can't see a picture, I sold two for about £60.00 and £80.00 (found at a boot sale for £1.00) a few years ago when CARN prices were really high, what colour is it? Is it matt or shiny. They are so simple reminds me of what you would do with a spare bit of clay at the end of the day but so collectable and still relatively rare, mostly unmarked so a good one to look out for. Sorry to dissapoint, its not one of his little owls that are sought after, see bottom link below where three are shown, this sight is brilliant for photographs. 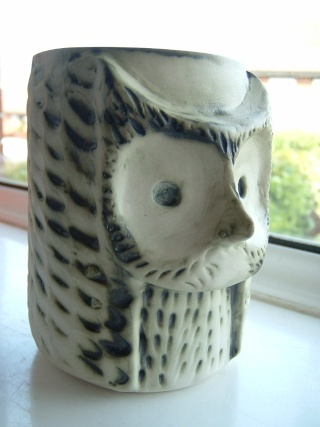 Its an owl relief vase small 1986-1999 which there are a lot of, I have three different sizes myself, not sure what it would go for, probably not what you paid, but carn does seem to be creeping up again. I have two pieces on ebay at the moment. Have a look, one is a totem and the other a rectangular vase. The totem is from the mid 70's and the rectangular earlier when he just marked his work with a number and no letter 1966-1972. The pieces I sold before that made the most money were the trapeziums, plaques little owls. If you are serious about learning more you need to buy Maria Miles and Pat Chappelle's book (CARN POTTERY). You will see pictures of pottery he made from when he was 13 and very sought after, in the main not marked but once you touch and see an old piece there is no denying what it is. That does look a little different to mine Ed, I wonder if it is shorter. The area on yours under its 'chin' looks shorter and wider than mine. Does it have twig like molding on the back ? Mine is 15cm tall x 8-9cm diam. Here is mine, with it's cat gardian. Hasn't changed that much then. I wonder if your is just a newer molding or if there have always been several slight variations. Just bought this piece on ebay - very good price - seller says its pretty modern and I do see backstamp is different than for my other pieces - well I like it which is the main thing. Just back from pottery foray in Wiltshire, and picked up this large 10 inch octagonal vase in my local charity shop! The base isn't marked, but I have seen and handled a lot of Carn items and it feels right. Anyway, if you know better, I'd appreciate your comments. AlanH wrote: Just back from pottery foray in Wiltshire, and picked up this large 10 inch octagonal vase in my local charity shop!